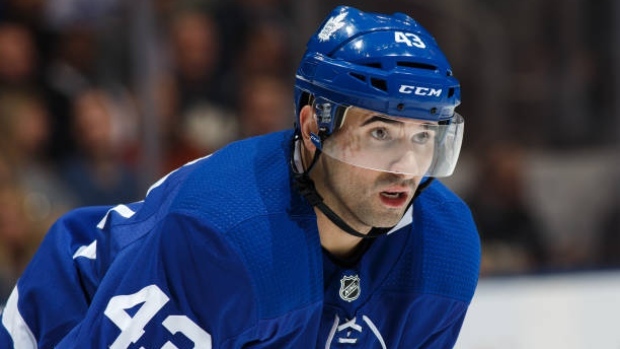 Nazem Kadri has seen some things. He's the only Leaf who will dress Tuesday night that was involved in both recent Game 7 collapses in Boston. He saw the 18-wheeler go off the cliff with jerseys thrown on the ice. He was there when interim coach Peter Horachek mentioned the “Give a [expletive] meter.” So, he's not getting too worked up about Toronto's current skid. Babcock hasn’t sensed too much frustration from the players despite the latest stumble. Babcock noted that the way Toronto has lost is more concerning than the losses themselves. The coach believes that, first and foremost, the Leafs must cut down on the rush chances against. But there may be an overriding issue. The Leafs have trailed by at least three goals in each of their last four games. They have not had a longer streak since a five-game run like that in October 1991, according to the Elias Sports Bureau. But some of the issues plaguing the Leafs predate the latest four-game run. Backup goalie Garret Sparks raised some eyebrows with his post-game comments in Ottawa on Saturday. Does Kadri think more emotion could help? Babcock was asked what he thinks about players with smaller roles speaking up. One bright spot for the Leafs of late has been the penalty kill. They have gone a season-high five straight without allowing a man-advantage marker killing off all 11 chances. Mitch Marner led all Toronto forwards with 4:30 of shorthanded ice time in Ottawa. This is the first NHL season in which he's gotten consistent min​utes on the penalty kill. “I did it for two of my three years in junior and I was talking to (assistant coach D.J. Smith) about [killing penalties] this year and he said we may need somebody to hop in,” Marner explained on Saturday before the game. ​The penalty-kill unit has bonded this season over something called the Dr. Kill stick. It's a three-foot stick covered in white tape with a sharp edge that gets passed among players on the unit throughout the season. A player keeps it in his stall until the team allows a P.K. goal against and then it gets passed on to another player as determined by Smith. It's a gut-call type thing for the coach and players can lobby to get it if they're feeling good. Every game where the Leafs don't allow a power-play goal the player with the stick is able to put his logo on it with a sharpie. Some use their initials or sweater number. Marner apparently uses a horse, because Smith has been known to call him 'Stang as in a mustang. Frederik Gauthier has the most logos – a goat, of course – on the stick, but Marner now owns the longest streak. How much pride does he take in that? The Predators have struggled on the power play this season, ranking 30th in the NHL (13 per cent).